Brooklands Flying Grounds, Weybridge, Surrey, circa 1908-1913. 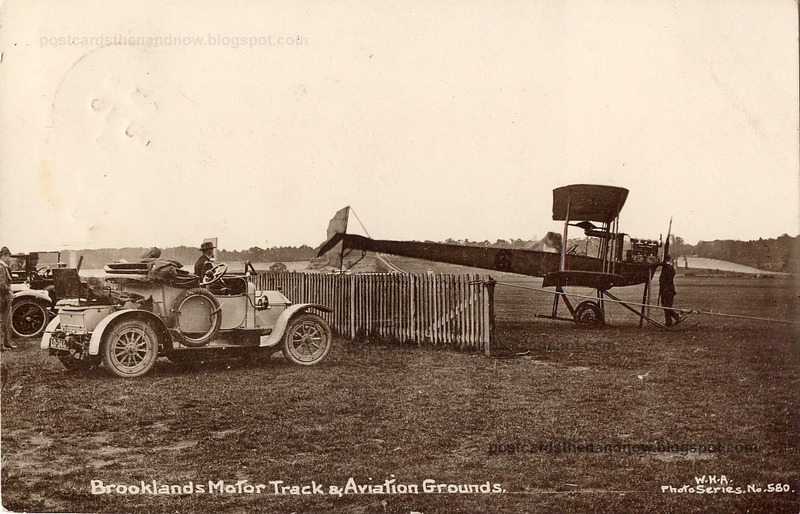 Brooklands motor racing circuit was opened in 1907. 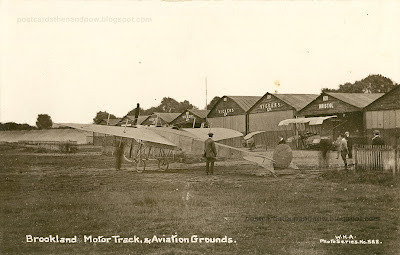 It also housed one of Britain's first aerodromes, opened in 1908, where aviation pioneers would try out their latest aircraft. 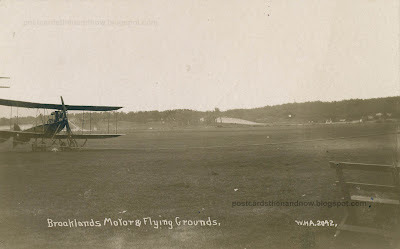 Later there were flying schools and aircraft factories on the site. 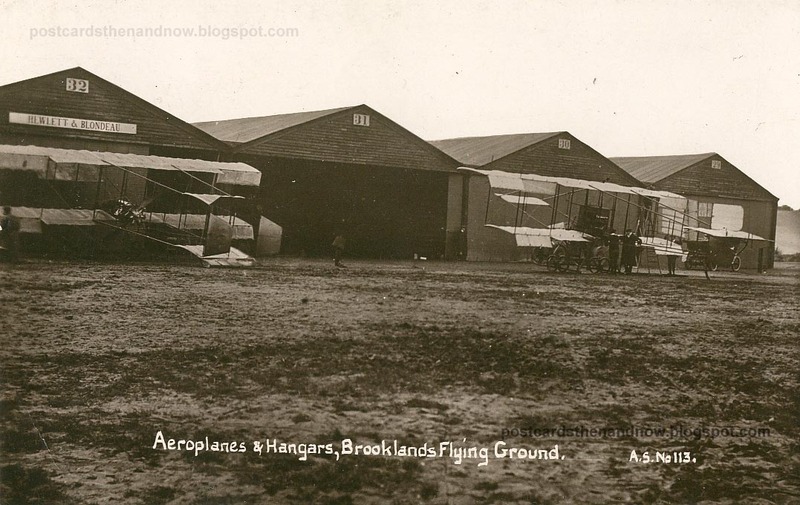 Much of the site still exists and is owned by the Brooklands Museum. In the bottom two postcards you can see part of the banked racing circuit that Brooklands was famous for. 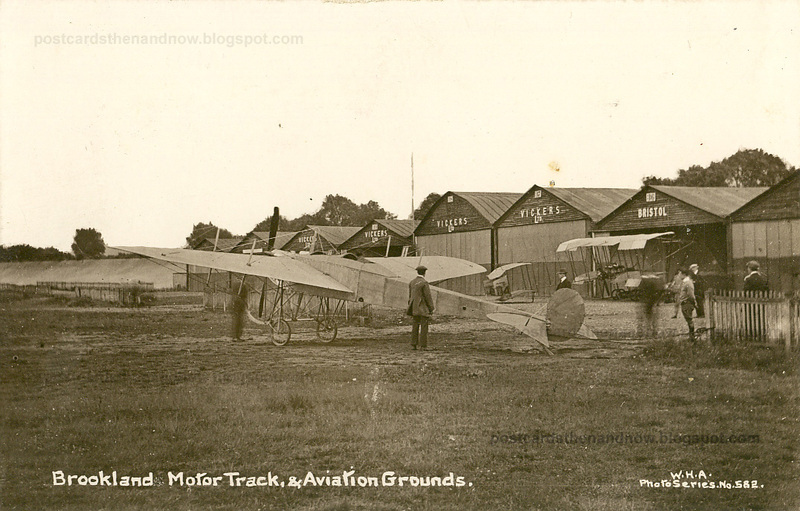 These postcards were published by Andrew Smith of Surbiton and W. H. Applebee of Ashford. The aeroplanes in the Andrew Smith postcard (AS113) look a little earlier (c1908) than the WHA postcards (c1912). Smith was producing postcards from about 1903, eight years before Applebee who started in 1911. Smith continued producing postcards until the late 1920s. Click the postcards to enlarge. Please visit the Sepia Saturday blog where the theme this week is 'Flight'. These are amazing! I just enjoy these kinds of old photos! Thanks. Oh, my these are outstanding ... great find! Planes didn't used to be that much bigger then a car. I'm so impressed that you have such a nice selection of cards to fit this theme. The car in the second photo is so interesting. Those wheels or tires are so huge. Bi planes are pretty fascinating too. Magnificent postcards, Howard. I don't think I would have been to keen to fly in one of those things. Great set of postcards- thanks for sharing! Those old planes always look like they weren't finished being built. When these pictures are enlarged it seems to show up the flimsiness of the aeroplanes and makes you realise just how brave (or foolhardy) those early pioneers were. A great set Howard. Those are great postcards, especially the second and third views. It must have taken a lot of nerve to fly one of those planes. When you click and enlarge them you really do see the quality of the images. Great stuff. 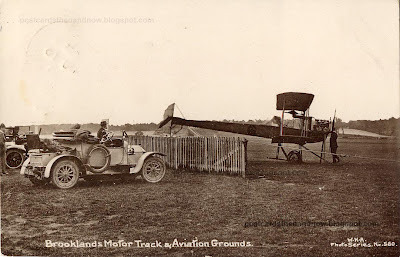 Daring young men in their flying machines. Wonderful photocards. A reminder that aviation was once very experimental and full of imaginative entrepreneurs. After the second photo I remembered the 1965 movie "Those Magnificent Men in their Flying Machines" which probably used some of these same photos for research.